Prayer means to ask God or Supreme Spirit for something with intense yearning. The word Prayer or Praarthanaa (in Sanskrit) is derived from two words ‘Pra’ and ‘Arthanaa’, which means ‘pleading fervently’. 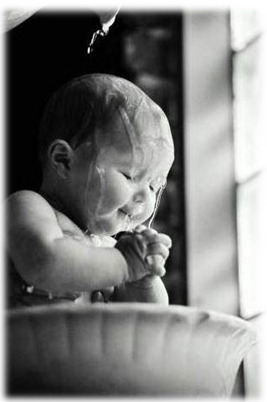 Prayer is an act of addressing the God or Higher Spirit, for the purpose of worship or petition. Through a Prayer, devotee expresses her helplessness to God and asks to endow her power to solve the problems or to complete a task. Specific forms of Prayer may include praise, guidance request, assistance, confession as an act of reparation or an expression of her thoughts and emotions. Thus, Prayer is carried out from the primitive human times for various reasons. How is a Prayer conducted? There are many ways by which the Prayer is conducted. It is bifurcated into three leading ways. 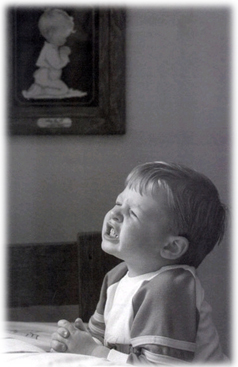 Generally Prayer is conducted with the mere utterance of the words, it could be mentally or a loud. The words used in Prayer may take the form of words of gratitude, a spontaneous utterance, an intercession, a hymn or an incantation. There are optional ways of positioning hands in certain manners. Praying can be done in public, in or as a group or in private. Prayer mainly includes respect, love, pleading and faith. Prayer is also an important tool of spiritual practice in the generic spiritual Path of Devotion. Scientific studies of Prayer have mostly concentrated on its healing effect for sick or injured people. Science does not abide by any particular norms to Pray but it focuses on the benefit a devotee gains from Praying. Simultaneously, science suggests certain methods to multiply the effectiveness of Prayer. Major religions in the world, involve Prayer in one or the other way according to their rituals followed through a strict sequence of actions. Few religions also constitute the rights to who may Pray, while other religions teach that Prayer can be done spontaneously by anyone at any time. There are numerous ways of Praying developed by different kind of religions. These forms mainly depend and enclose on beliefs and situations in Prayer. Various spiritual traditions offer a wide variety of devotional acts. There are morning and evening Prayers, graces said over meals, reverent physical gestures etc. 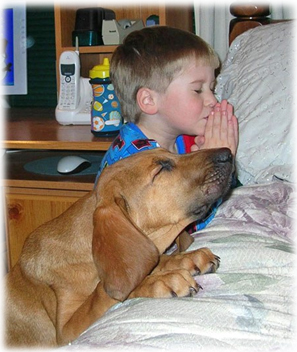 Some Pray according to standardized rituals and liturgies, while others prefer extemporaneous Prayers. Still others combine the two. Native Americans regard dancing as a form of Prayer. Orthodox Jews sway their bodies back and forth. Prayers include certain beliefs and intentions, enclosing a variety of understandings along with its execution and enactment. The finite can actually communicate with the infinite. The infinite is interested in communicating with the finite. To inculcate certain attitudes in the one who Prays, rather than to influence the recipient. To train a person to focus on the recipient through philosophy and intellectual contemplation. To enable a person to gain a direct experience of the recipient. To affect the very fabric of reality as we perceive it. Prayer is a catalyst for change in one's self and/or one's circumstances, or likewise those of third party beneficiaries. The recipient desires and appreciates Prayer. 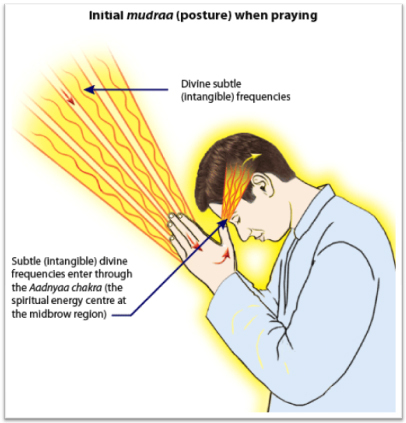 Science has identified many positions and postures of Praying Mudraas (postures) to gain and imbibe the maximum divine energy. 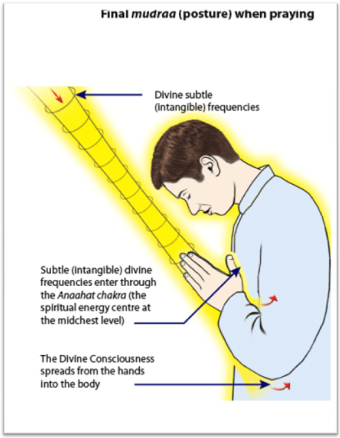 In the following diagram, this method states the actual process which happens at a spiritual level when one Prays. It is the best and the recommended method for Praying. 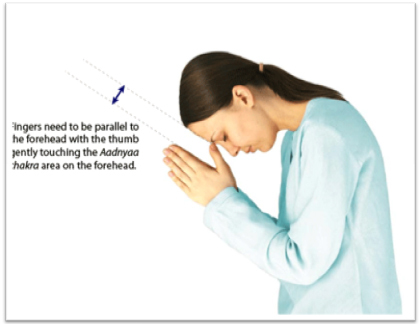 This method of Praying involves two postures or mudraas, divided into two stages. Stage 1 is to gain the divine energies and immediately followed Stage 2 is to imbibe the gained divine energies. While Praying in the first stage, one raises hands with the thumbs gently touching the mid-brow region or the Aagyaa Chakraa (spiritual energy centre at the mid-brow region in the forehead). When one bows head in this position, it awakens the spiritual emotion of surrender. This in turn activates the appropriate subtle frequencies of deities from the Universe. These divine frequencies come in through finger tips, serving as receptors, then channelized into one’s body through the thumb to the Aagyaa Chakraa. As a result, it increases the positive spiritual energy which makes feel lighter and gives relief from symptoms of physical or mental distress. Fingers should be parallel to the forehead. Fingers should not be stiff but relaxed. Thumb should be lightly touching the area of the Aagyaa Chakraa. Hands need to be gently pressed with each other. 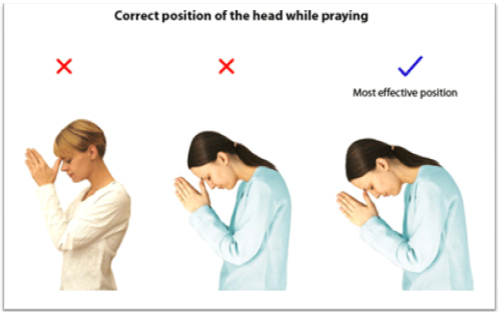 After finishing the first mudraa, one should immediately impose the second mudraa (posture) as shown in the diagram above. After the completion of the Prayer, one should not bring his hands down immediately; they are to be placed in the mid-chest region in such a way that the wrists touch the chest. This facilitates the process of more completely imbibing the divine energies. Imbibed energies then transmits to the Anaahat Chakraa (in the mid-chest region). Ultimately these energies get equally distributed into all seven Chakraas (namely mu in whole body. 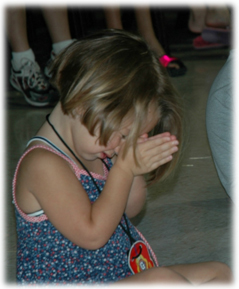 It is really important to provide attention on the Praying position. All the religions have distinct Praying positions. 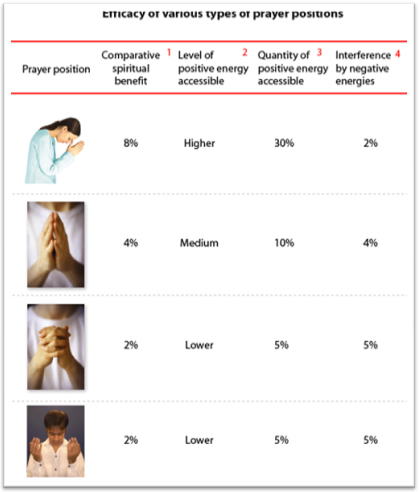 A spiritual research conducted considering the various hand postures (mudraas) related to Prayer, which denotes the following findings in terms of efficacy of positions. One can try a subtle experiment, saying the same Prayer using each of the above mudraas separately. One conducting the Prayer can be truly benefited by considering the mechanism as a key factor. The spiritual level of a person generally is defined by the reason for which one Prays,either for spiritual growth or worldly benefit. Benefit of the Prayer depends on the type of mudraa one uses. When one pays gratitude along with Prayer, it helps to increase the focus and concentration. 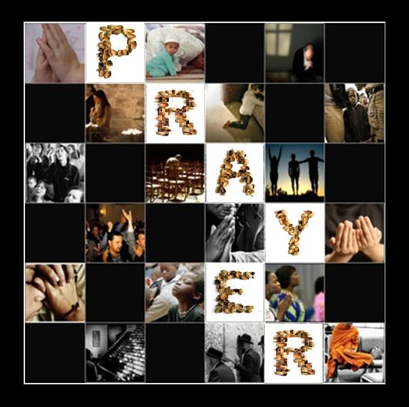 Prayer is one of the simplest and most effective ways to attain and know God. A practitioner can fairly feel the presence and fruits of a Prayer, when listened. Prayer is communion with God. Those who know God better are the one who spend quality time to Pray. 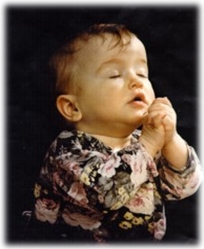 It is not possible to know God, if we Pray occasionally. We cannot get to know God just by following any religion. God reveals Himself to those who really care and Pray. Prayer not only changes problematic situations and circumstances, but can also change one’s attitude towards it. 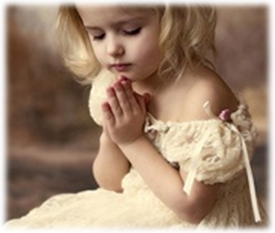 If one wishes to make one’s dream come true, then Prayer is the key. Prayer can change and help, because God listens through Prayer. When one Prays, receives wisdom and clarifies the perspectives and is able to make wise and godly decisions. Prayers make us to see into spiritual realities beyond what the human eyes can see. 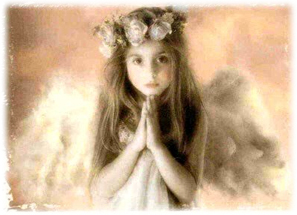 Prayer is an understanding of the spiritual powers behind activities and realities visible to the human eyes. Ultimately, Prayer is the most relevant way to attain happiness and spiritual growth.